Did you know you can access premium Red Hat content by using a Red Hat Enterprise Linux VM image in the Azure Marketplace? Three weeks ago we announced availability of Red Hat Enterprise Linux Pay-As-You-Go (PAYG) images in the Azure Marketplace. Today, I will show you one of the benefits you get from provisioning a Red Hat Enterprise Linux PAYG VM on Microsoft Azure. Alternatively, you can use the Red Hat Enterprise Linux quick start template or command-line interface to provision a VM. As soon as your VM is running, select it in the portal UI. The “Settings” blade should automatically open and you will see a line in the Support & Troubleshooting section, “Red Hat Customer Portal,” as illustrated below. Following the link “Go to customer portal” will initiate a single-sign-on (SSO) process to the Red Hat Customer Portal. Initially you will go through a set of steps to associate your Azure account with an account on Red Hat Customer Portal (either new or existing). Upon successful initial registration, clicking the link next time will sign you in to the Red Hat Customer Portal directly with no need to type the user name or password as your existing identity in the Azure portal will be used. Once you are logged into the Red Hat Customer Portal, you can read the official Red Hat product documentation, find solutions and FAQs, and access a variety of other subscription-protected content on the Red Hat site. You can also open a support ticket directly with Red Hat using the Red Hat Customer Portal. 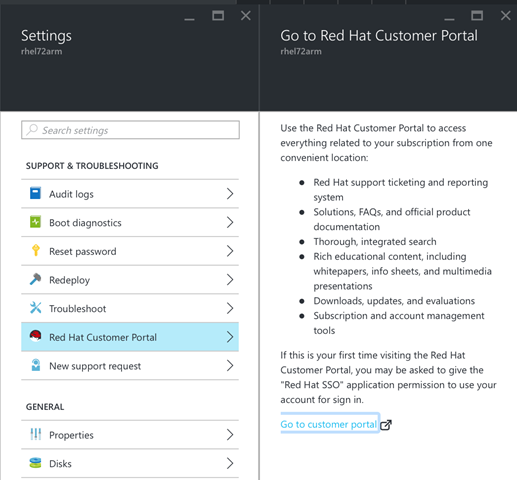 The ability to access the Red Hat Customer Portal directly from Microsoft Azure portal is one of many benefits included with the premium Red Hat Enterprise Linux VM image on Microsoft Azure. Consult the Red Hat Enterprise Linux VM pricing page and FAQ for additional details. Please try it out and enjoy the benefit!